Band breakups are kind of like divorces. Sometimes they're amicable, but often they're not. Like divorces, sometimes there are assets to be divided and making the wrong calls here can have long-lasting implications. Despite some short-term hard feelings, it is possible to manage a break up while protecting your rights and keeping your sanity intact. If you have a band contract, it should have provisions that dictate how to deal with things like unused recordings, songwriting credits and more, so all you have to do is abide by it. But for those who don't have a contract specifying how things are to be handled, here are some tips. How long your band was together and how much work you've done will dictate how messy the break up might be. Some issues will be more contentious than others, and you'll have a much easier time working through all of them if you clearly identify them and treat each one as a separate subject whenever possible. Each band's situation will vary, but here are a few common concerns that arise. This one is really important if your group is earning royalties or if anyone in the group hopes to use some of the group's songs in future projects. In reality, this conversation is one of all bands should be having well before a break-up enters the equation. You might be surprised how differently you all view your own contributions and hammering these things out when things are tense is tough. If you have made agreements in the past when it comes to songwriting credits, stick to them. You might be angry now, but if you have agreed to share all the credit for the music equally in the past - even if only one of you actually did the work - take some deep breaths and honor the agreement. If you all share ownership of the songs, you should discuss what that means. Will you all have free reign to "cover" the songs in future projects? What happens if one of you joins a new band and suddenly has a hit on your hands with a song that was co-written with this band you're leaving now? In that case, the people who share songwriting credits are due to a royalty. It will get more complex if it becomes an issue sometime down the line and hasn't been addressed. If you have unreleased recordings sitting around, what are you going to do with them? When you've invested a lot of money in recording, then obviously the idea of trying to recoup that money by selling the music is appealing. If you have signed a contract with a label that obligates you to deliver an album, then you're going to have to deliver the album or buy yourself out of the contract. How much that costs depend on how much the label has invested in your band and what they think they could have made from selling your record. If you're dealing with a small indie, you might be able to come to some sort of agreement. If you're dealing with a larger label that has lawyers involved, then you'll need to get a lawyer as well. If you don't have a deal, things are easier. If you're still friends and can work together to try and sell the record, great. Just make sure you discuss things like how you'll divide the work, the expenses, and the profits. If you can't work together, then you might have to chalk it up to experience. If some members of the group have invested more financially into the project than others, the fair thing to do is try to reimburse them somehow. Many times, groups don't just invest in recording together, but they also sink their cash into gear for the group. If you chipped in for a drum kit, but you don't play the drums, don't fight for it. The drummer can pony up the cash to pay everyone back their share, or you can all sell the kit and split the cash. 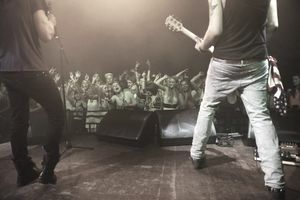 In bands, you often find that some members are in a position to contribute financially more than others. Obviously, this is less of a problem when things are going well, but can be a huge problem when things break down. Unless you have some agreement that states otherwise if you're the one who has been shelling out the cash, you can't make anyone pay you back. Of course, everyone should try to make this kind of stuff fair, but it doesn't always happen. If you self-released your record, what happens to your stock when the group is no more? This one really depends on how acrimonious the split is. If you can maintain a professional relationship, then it is in everyone's interest to continue to try and sell the stock. If you do so, then make sure you all are on the same page as to how it will work like who will shoulder the responsibility and how income and expenses will be handled. If you just can't do it, then the stock is a wash. Note the important thing here: You all have to agree what will happen. You can't decide unilaterally to sell the stock over the objections of everyone else. The above list of issues is in no way exhaustive. Your specific circumstances will dictate the issues you have to handle. If you handle everything methodically and with a level head, and if you remember that you all used to be friends if the split is getting nasty, then you should be able to address everything you need to and keep your sanity at the same time. What happens in the band stays in the band. Don't go blabbing everyone's secrets around town. Your bandmates likely have a few things on you that you don't want everyone to know, right? Exercise some discretion. Similarly, don't bad mouth people. It's bad form. There's usually enough blame to go around, and it doesn't really fool anyone. If you owe people money, try to pay them back. At least acknowledge the debt and do your best to make it right. If some of you plan to continue to play together, don't use this bond to bully other band members when you're trying to come to an agreement on how to work out issues in the break-up. Don't withhold recordings, gear, money or anything else just because the balance of power happens to be in your favor for the moment. Get some perspective. As intense as these situations can be, if you take a step back, you'll see that the future of civilization is not hinging on your actions. It will help you keep a level head. Band breakups can be incredibly stressful, but you can mitigate that by taking the right approach. It's a learning experience, and when things calm down, you'll realize you've come away with some good lessons that you can apply to your music career in the future.